If you are like me, you always have that go-to outfit. That go-to same old outfit your friends and family are tired of seeing you in. "Hey aren't you a fashion blogger now? Where are the fancy outfits?! "That's pretty much how my life goes! Well I am here to tell you, that I love comfort as much as I love dressing to the nines. It simply depends on my mood that day. "Am I bloated because I ate too much the night before?" It honestly always comes down to that, like 90% of the time. In this post I will also show you how I wear 3 of my wardrobe go-to's (leggings, oversized jackets, and a t-shirt). Keep reading to see what my top 5 wardrobe essentials are, whether I am wearing them all together or simply using them as key pieces for a certain outfit that day. Whether they are skinny, boyfriend, girlfriend, bootcut, bell bottoms, fringe and the list goes on and on. There are infinite amount of denim styles in the world today and I know that at least one of them or maybe even two are your favorite. I, for instance, have a favorite pair of light blue skinny jeans and boyfriend jeans. Some of my favorite stores to purchase denim from are: Old Navy, Zara, Fashion Nova and The Loft. We all have that jacket or oversized cardigan we love to wear with literally anything. I am currently wearing my knit taupe colored, oversized cardigan from Banana Republic, as I casually sit at a Starbucks and write this post. I also have my go to oversized denim jackets for "going out", as seen here, and here and well.. the list goes on and on. I can always count on my oversized babies to keep me warm and stylish! Speaking of oversized, can we talk about my new obsession? 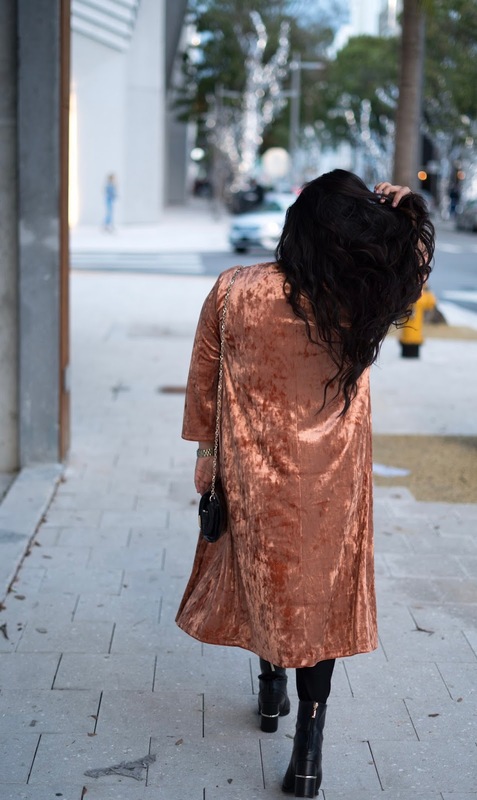 This rust colored velvet duster?! Only $12.00 at Forever 21! I recently graduated college and was gifted a pair of shoes I never knew I needed. I have never really been a sneakers girl. My shoe collection is usually boots, booties, flats (for work), heels, and cute sandals. By the way, sandals (everyday) are a thing when you live in Miami. But back to the sneakers, I recently got the women's Adidas UltraBoost 4.0's in the color Ash Pearl. Let me just say, that why I never owned a pair of Ultra Boosts is beyond me! They are the most comfy yet trendy sneakers I have ever owned! Yes, they are on the pricey side ($180.00) but totally worth it! Side note: sneakers I am looking to add to my wardrobe are: more free-runs, vans Sk8-Hi's, keds and more chucks! My style is kind of all over the place and versatile. I believe I have mentioned this before, countless times, but I love to include comfort into any outfit I style. T-shirt's are always a win for me. You can wear a cute fitted or loose t-shirt with denim, leggings, shorts or skirts. Tucked in t-shirts are always my favorite! I love making the top loosey-goosey and wearing a fitted bottom. Sometimes I will even buy a t-shirt in the men's section or buy it from the women's section two sizes larger and wear it as a dress. Band tee's are always a win-win! I say dresses because there are so many versions of "the little black dress". My version of a black dress with Miami's climate might be different than that of someone who lives in cooler climates. I personally have various of these dresses. They are long, short, mid length, long sleeve, short sleeve and even no sleeves. One can never have too many little black dresses. Part of my theory behind the world famous term "little black dress", is that since it is such a neutral color one can pair it with just any color or style. Whether styling it down or up, they just go with anything! These are my TOP 5 wardrobe essentials, I'd love to hear about yours! Let me know in the comments below or on my instagram! This post pretty much sounds like my own wardrobe lol! I never thought of throwing in a nicer type of cardigan with the regular skinny jeans or leggings. I usually always wear skinny jeans, t-shirt and sneakers or toms......you've given me a twist plot in my wardrobe!! LOVE! Those are some really great essentials to have! Especially on a day-to-day basis when you can't figure out what to wear, they make a great choice to choose from everytime!